Timings for Matches On Saturday .Fixtures can be seen at the venue or on registered email id. After finishing of succesful events for the adults in badminton, we are back with one more badminton tournament. But this time its for our future stars. 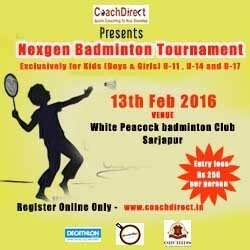 Coachdirect in association with White Peacock introduces to you kid's badminton event (boys & girls) at White Peacock Sarjapur,Bangalore. Last date to register 11th Feb (Thursday). Please note the system will calculate the appropriate category based on the date of birth. Cut off date is 1-Jan-2016. Please note: Strictly indoor non-marking shoes only allowed at the venue (no black sole). Birth Certificate is a must. Will be published and sent by email to all participants by Friday, 12-Feb-2016. Register in the form below.Hurry Up ! !